After the last ballet performance of the season by the Atlanta Ballet, Kati and I headed over to Mary Mac’s Tea Room to try out the food. We have a list of Atlanta restaurants to try out and this was second on the list. 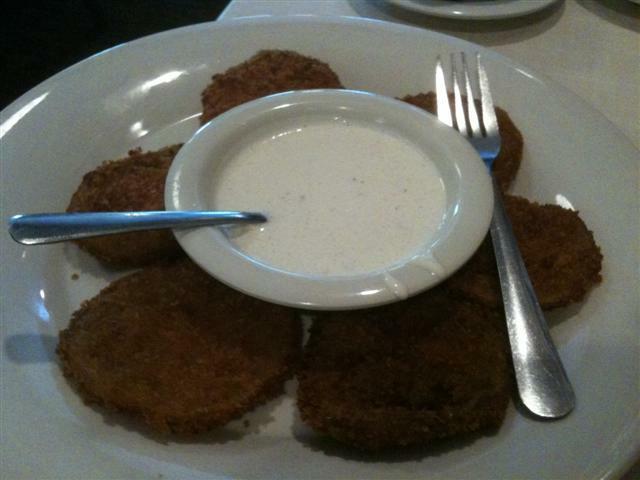 We ordered some Fried Green Tomatoes as an appetizers. They were pretty good, not as good as I remember them being at the Blue Willow. Because this was our first time at Mary Mac’s, they gave us some complimentary “Pot Likker”. Pot Likker, also known as Collard Liquor, is the liquid that is left behind after boiling collard greens. 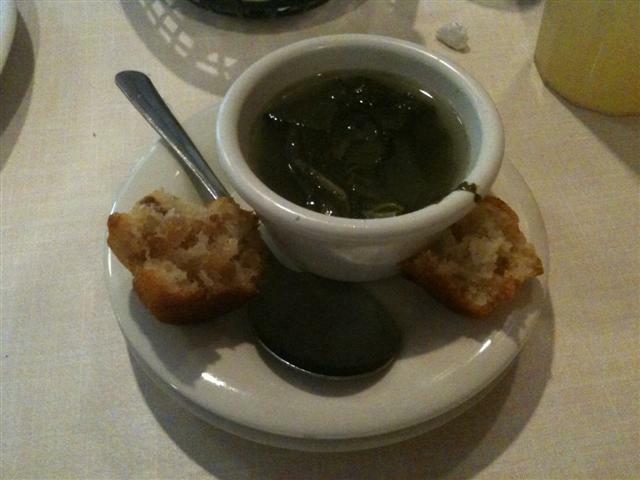 It’s basically soup, it was pretty tasty with corn bread crumbled in it. Speaking of cornbread, they gave us an assortment of breads to eat with our dinner — cornbread, yeast rolls, and cinnamon rolls. They were pretty amazing tasting. I don’t think I got a picture of them though… oops. For dinner Kati ordered the Country Fried Steak and Gravy… it was pretty good, but she said she thinks her mom’s version is better. 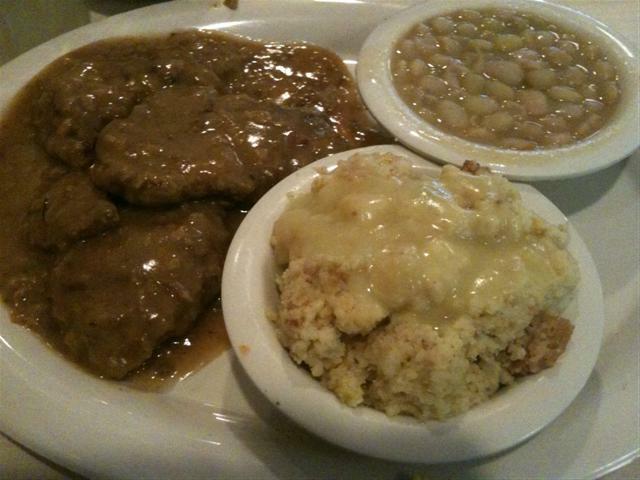 She also ordered butter beans and cornbread dressing on the side. The dressing was absolutely amazing! I ordered the Roast Turkey with cornbread dressing, gravy and cranberry sauce. For my sides I ordered the macaroni and cheese and potato cakes. I was a little disappointed because I only got two small potato cakes, I think four would have been the appropriate number. The mac and cheese was probably the best I have ever put in my mouth. The entree itself was also extremely delicious. Although there wasn’t much room in my stomach, I had to order something for desert. 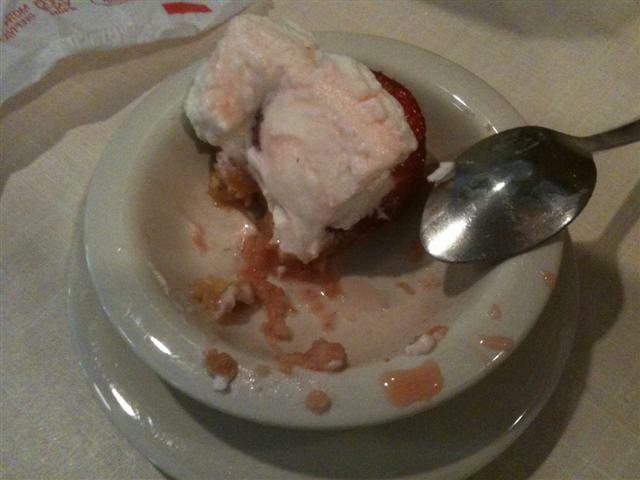 I decided to try out the strawberry shortcake… and I accidentally ate half of it before realizing that I didn’t take a picture, so here it is half eaten :). The shortcake made the desert! It was perfectly sweet and had a nice buttery, crunchy crust. 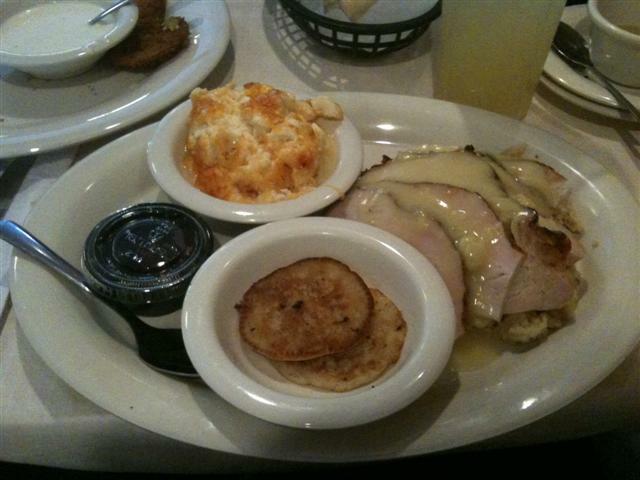 Mary Mac’s is definitely on the “will visit again” list. The food there was just astounding and there is so much more on the menu that looked appealing. If you are ever in downtown Atlanta, I would definitely recommend this restaurant.